Oddy, Nicholas (2012) Prince of Darkness. The Train Collector. In histories of the metal toy industry there is to be found an oft repeated story: W J Bassett-Lowke visited the 1900 Paris International Exposition where he met Stefan Bing. 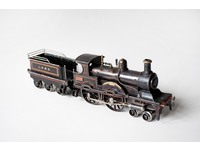 Seeing the build quality and noting the low retail price of Bing’s German outline toy trains, he commissioned Bing to make him a batch of Gauge III models of the locomotive ‘Black Prince’. 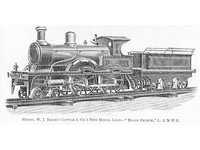 This was duly done and, with the loco’s release on to the market in January 1901, Lowke was later to claim - first to have invented and introduced the first ever ‘modern’, quantity produced toy/model British outline locomotive - and second to have been directly responsible for introducing German makers to the potential of designing products specifically for the British market. But, in fact, how realistic are these claims? By looking at surviving examples and returning to a close analysis of the primary evidence, this article attempts to find out.